Well, two and a half years later I have almost got a finished Rumford fireplace! I did find a local stone mason right in my little town of 2,500 people to build this for me. Neither of use had ever built one before so we both used this as a learning experience. We used the 48" throat, damper and smoke chamber on this project. It has been a lot of work and the talk of the town with everyone being very impressed when they see it. I will forward additional photos upon completion of the fireplace and after the rest of the house is completed. I did have one question regarding the damper. I used the cast iron damper and found that it does not open all the way when using the last notch in the handle. Is this normal? When I say does not open all the way I am referring that the damper is not completely vertical or leaning back past 90 degrees. I also included a photo of the outside of the log cabin. I have constructed this using 7 old cabins that I disassembled and combined together to make this 1700sf cabin. This has definitely been a labor of love and passion as I started this project in the summer of 1993 and will finish here in the summer of 2008. Only new material purchased to construct the mainframe of the house was 2-2x4's and 10-2x6's as the rest was recycled from multiple cabins and other structures all with ties to local history. Your website has proved to be most useful in this project along with the information from Superior Clay Products. I am looking forward to slowly breaking in this wonderful fireplace so that next winter I will be able to rest comfortably and enjoy its warmth. Once again thank you very much for your help and guidance. A "true original Rumford fireplace" can mean several things. A second meaning of a "true original Rumford fireplace" might mean you propose to use the materials available in Rumford's time or whatever period is represented by your log cabin. This may be where your masons are balking. Most stone will not hold up well to thermal shock and they may expect the stone in the firebox to crack and spall and for you not to be happy. 150 or 200 years ago fireboxes were built with the brick or stone available and it did fail which meant annual repairs and a coat of plaster to protect the brick or stone. I would at least test your stone by using it to contain a campfire and see how it stands the heat. Finally a 48" or 60" fireplace was probably not really a Rumford. Some early cabins had all-purpose fireplaces used for cooking as well as heat which looked more like the cooking fireplace at http://www.rumford.com/cookfp.html and, as we say on that page, these fireplaces pre-dated Rumfords but co-existed in summer kitchens with Rumfords in the main house well into the mid 19th century. So, here's what I think you should do: Build our 48" or 60" Rumford, using the Superior Clay throat, damper and smoke chamber which you can get at any of the dealers listed at http://www.superiorclay.com/dealermo.html Our dealers can also recommend masons to support or augment our list of masons at http://www.rumford.com/mason.html In such a period fireplace I would use stone for the firebox as was probably used in your area 200 years ago. Test it first, expect it to crack, spall and need repairs. It might last many years if you keep your fires small and raked toward the front to heat water or roast. And remember my customer's remark. He said five of the brick in the fireback had cracked and the face had spalled off another one. "It's great", he said. "The fireplace is only a year old and it already looks as if it's 200 years old." Promise your mason he won't have to come out to replace a stone every time one cracks. Keep me posted and send pictures. I have been trying to locate a stone mason or builder for an exposed field stone style 48" or 60" Rumford in the center of a log cabin. I have visited with a few in the area who claim to know about the Rumford style but upon the site visit and questioning it becomes obvious they really don't know. 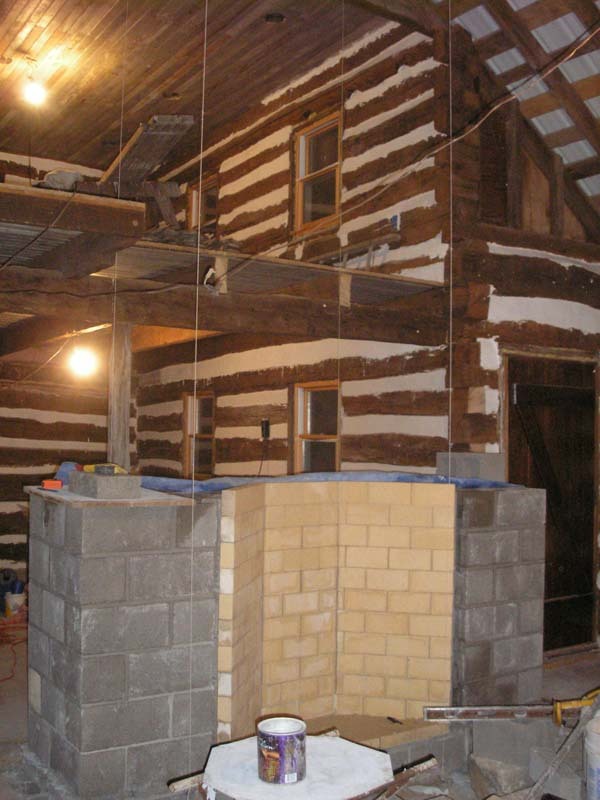 I built a log cabin combined from seven old cabins and have since the beginning of the project planning on constructing a true original Rumford fireplace. 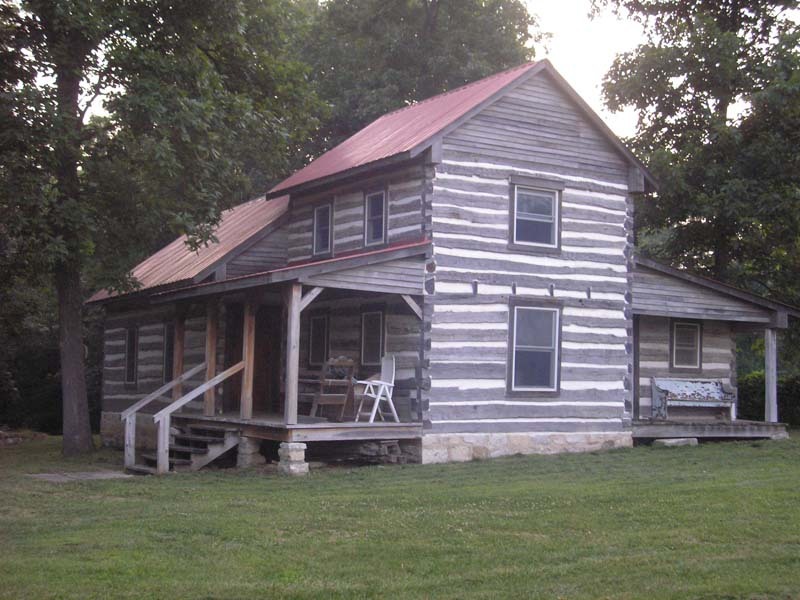 Would you by chance be able to recommend somebody in the central Missouri to St. Louis region that is capable of building a true Rumford using old cut stones that were gathered from all of the original cabins? As well, I could use some help in the layout and design with regards to fitting the fireplace in the area provided while making it blend in with the age of the logs in the cabin. In all cases the masons either don't want to use the old stones or want to build their version of a fireplace as opposed to a Rumford.